Waimauku has many outdoor activities in the area. Bike track riding, tree high-wire adventures, hot pools, West coast beaches, surfing, fishing, local golf courses, off-road 4 wheel driving, paint ball, meditation centres, famous gannet colony, wineries, clay pigeon shooting and much more. A handy location for weddings and wine trails. Or simply get away for a quiet weekend. 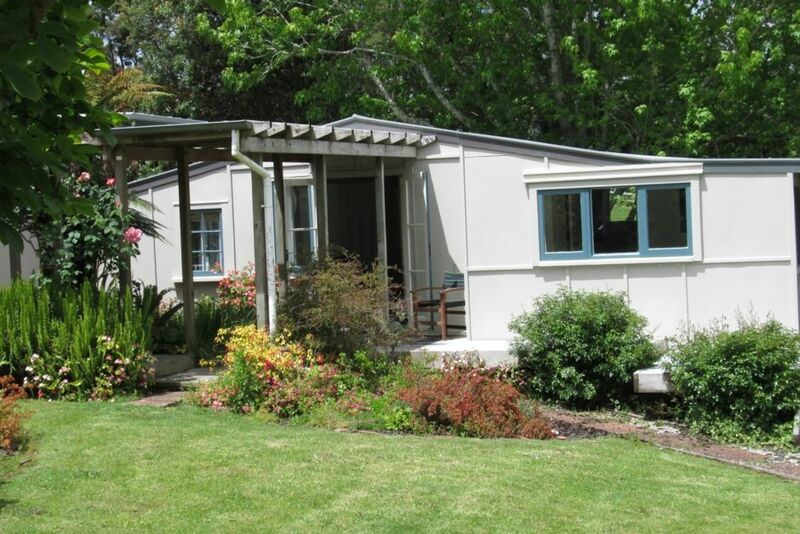 A cosy cottage set in a peaceful rural setting with sheep grazing in the bush and paddocks. The accomodation is a traditional bach style and is self-contained. It has its own deck and there is also a gazebo to read and contemplate in. Have a swim in the pool to cool off on hot summer days or enjoy a barbecue and wine on your own deck. Close to good local restaurants, gourmet food market, strawberry fields and locally grown produce. Plenty of local supermarkets to choose from. Your hosts are Karen and Edward. Edward is a prominent Auckland actor. Karen is a hat maker/artist and Literacy manager.She has her workshop in the barn on the property. Guests are most welcome to visit the hat showroom. A lovely environment with many native birds and wildlife. All this and only 30 minutes to central Auckland outside peak times. It's peaceful in pleasant busy surroundings. Traditional cottage with two bedrooms for couples or families. Self-contained and comfortable. Shower - hand basin - toilet (electric) and laundry tub. Off street parking near cottage. Easy access for wheeldchairs into cottage. Small step in cottage into bedroom and down to kitchen and bathroom. Use any time you wish. Children must be under supervision. Lots of local attractions and outdoor activities in area. We loved our stay. Edward was friendly and welcoming, both when we arrived and with all our communications, and our only regret was we were only there for one night.You are tucked away in a quiet rural setting, delightful, and with all the comforts you need. Edward thoughtfully had the heater on for our arrival as it had turned a little chilly which was much appreciated. We would definitely stay here again. Compact clean and very tidy. The cottage was quaint and very enclosed. Perhaps the carpet disinfectant or room air freshener was a little overpowering. The Television was almost postage stamp size, in today’s world how much does a 42 inch screen cost! (It would probably have been better without one at all) There was no outside sensor light for after dark entry. The bathroom was just adequate but old and the floors uneven and the doors all jammed due to the overall building settlement. The owner was very nice and helpful, the cottage was well stocked with tea coffee etc and spotlessly clean and tidy. The rural setting was charming and as we only stayed basic over night it more than served its purpose! Lovely little bach in a nice quiet area. Fully secure. Thanks for your lovely words. We try our best to make you feel at home. Thanks for that. We aim to please. Edward was very easy to deal with and welcoming to us. It was helpful to be able to check in early as we have a little baby. Great location for weddings. Thanks for your kind words. We try to make people welcome and to feel at home in our very lovely setting. Had everything there. Great location. Would like to return. Nice people even rung me when I left clothing behind. Beautiful hats too! Thanks Karla for your kind words. We are grateful you kept the cottage tidy and clean. Please come again and enjoy the peace and quiet we have to offer.